Ethereal Scottish outfit Cocteau Twins are long gone, but a new vinyl reissue of early-period compendium Stars and Topsoil: A Collection (1982-1990) means that the Grangemouth-bred dream pop greats won't be forgotten just yet. According to a press release, the 18-track compilation, which covers material from their debut 1982 LP Garlands up to 1990's Iceblink Luck EP, was originally issued by 4AD on CD in 2000. 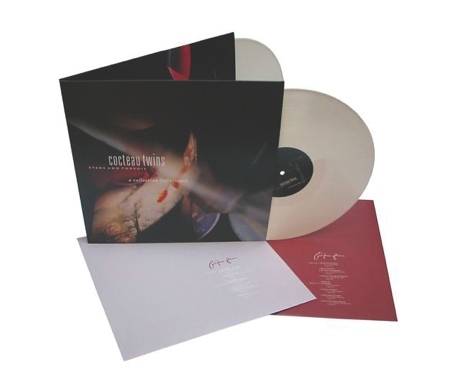 Beggars Archive will rerelease the collection as a double white vinyl package on February 6 in Britain. A North American release is in the works, but it'll only appear on standard black vinyl. Fans on this side of the pond can, however, order the European version here. While collecting some of the group's early triumphs ("Sugar Hiccup," "Pearly-Dewdrops' Drops"), the repress also serves to correct a misconception about who played what within the Cocteau Twins. "One thing that was never corrected from the original sleeve is the players' credits. Robin [Guthrie] is listed as 'guitars' and Simon [Raymonde] as 'bass' but in reality both contributed piano, bass and guitars (and more) across the history of the recordings," the press release explains. "So now you know." 2. "The Thinner The Air"
8. "Heaven or Las Vegas"